SHOTTSMAN comes with ‘TWO BIG SOUND: 7 Nights a Week! Not too long ago I couldn’t resist the temptation to swing by a rare sound system clash at Brixton Town Hall featuring Sir Coxsone Outernational and Saxon Studio. As a one time ardent follower of Coxsone sound I stepped into the dance with a little trepidation as it could never live up to those super sonic clashes when both sounds were at their peak. I was surpised to see Coxsone running tunes off burnt CDs but hearing Burning Spear on sound again was indeed a joyful moment. Lloydie Coxsone’s invocation on the mic urging one and all to respect the no smoking ban was hilarious especially as he commenced blazing the herb upon completion. 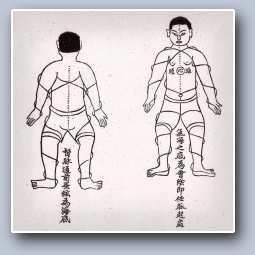 It had been a long time since I’d stood up in that legendary hall and I, along with most of the man there, was a couple of decades older. There were many familiar faces in the dance and I wasn’t surprised when the man called IG Culture appeared from the ranks of Saxon Studio filming the set. That footage is now seeing light of day via and the Shottsman and Holy Roller who present TWO BIG SOUND, Part One: Seven Nights a Week. 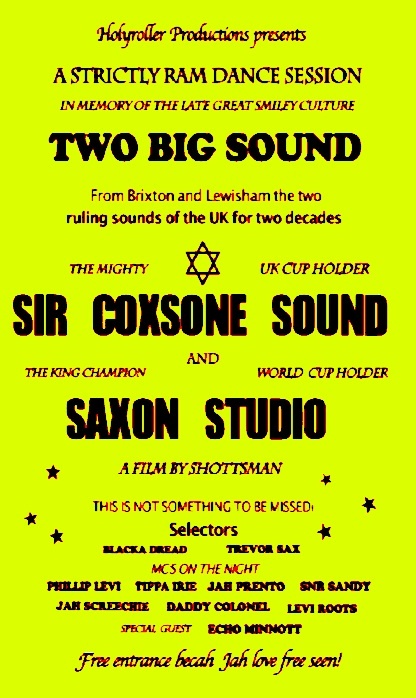 “TWO BIG SOUND revisits the ‘platinum era’ of the UK sound system in which two sounds ruled, The mighty Saxon Studio sound and the legendary Sir Coxsone sound. This film is a ruff cut history lesson with a difference, it is by no means the bible of the UK sound system, It doesn’t cover every facet of the sound system UK history, nor does it follow a timeline or chronology. 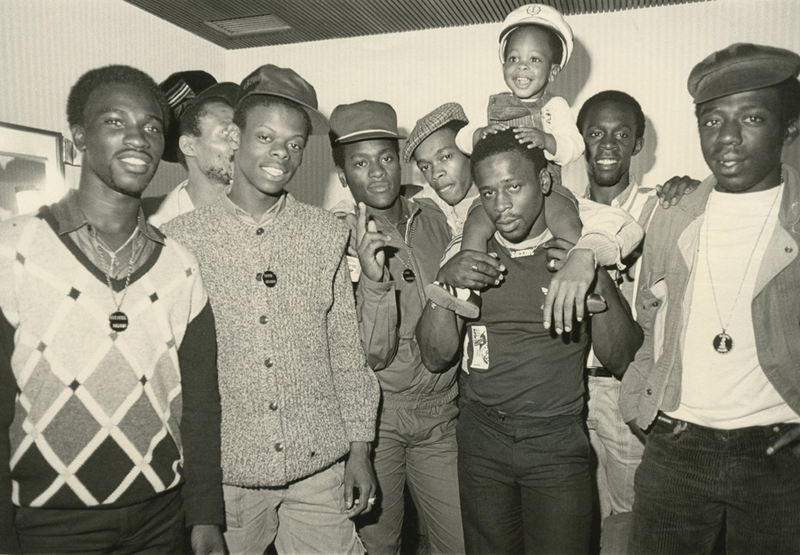 What Two Big Sound does do, is uncover subjects rarely heard about in Black UK music history. 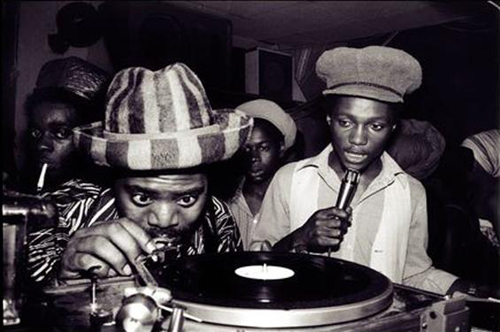 The film takes an earthy look into the lives and music passion of some of the pioneers within the Saxon and Coxsone massive, they who lived and breathed and affected sound system culture from the UK, Jamaica and the rest of the Reggae world. This entry was posted in Words, Sound & Power and tagged Bikey Dread, Blacker Dread, Brixton Town Hall, Chris Peckings, Cup Clashes, Dancehall, Echo Minott, Festus Coxsone, Holyroller, IG Culture, Jah Prento, Jah Screechie, Jamaica, Levi Roots, London, Philip Levi, Reggae, Saxon Studio International, Scottsman, Sir Coxsone Outernational, Smiley Culture, Snr San, Sound System, Tippa Irie, Trevor Sax. Bookmark the permalink.